Made with just 6-ingredients, this Green Goddess Dressing is quick to make, full of flavor and will turn any boring salad into something sensational. This post was created in partnership with our friends at Nutpods. I’m here to tell you that salads do not have to be boring. And they don’t have to be slathered in a heavily processed dressing filled with inflammatory oils and unpronounceable ingredients to taste good. 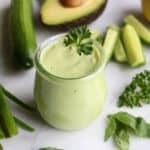 Those days are in the past because today, I’m sharing with you an oh so simple and tasty Green Goddess Dressing that’s full of healthy fats and made with only clean ingredients! This dressing is made entirely in a food processor or blender. It has a lovely fresh flavor from the basil (I heart basil) and it’s infused with just enough garlic. The creaminess comes from the avocado in combination with a dairy-free creamer called Nutpods. 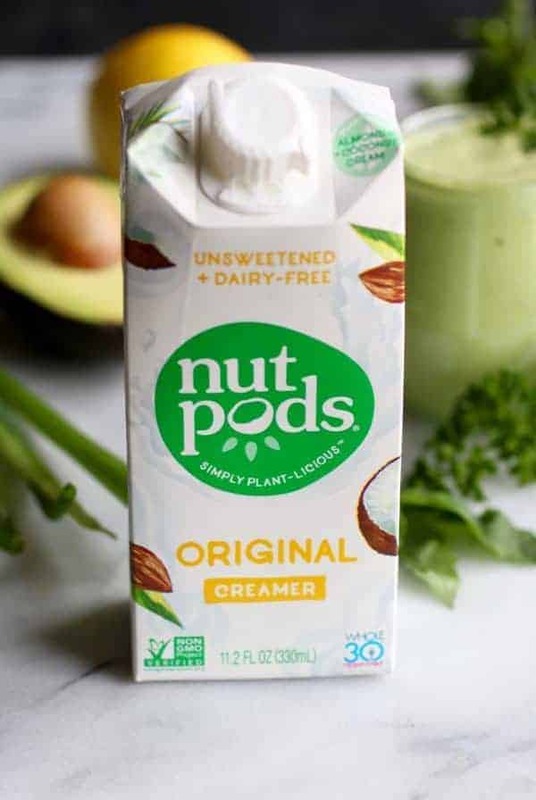 We recently were introduced to Nutpods by our friends at Whole30 and it’s hands down one of the best dairy-free creamers we have tried. In fact, It’s a new staple for both Jessica and I, especially when we’re Whole30’ing it! Green Goddess Dressing is vegan-friendly, dairy-free, egg-free, paleo-friendly & Whole30-friendly. It’s nice and light with only about 60 calories, 1 gram of carb and 6 grams of fat per serving. Nutpods is a fantastic dairy-free creamer alternative. 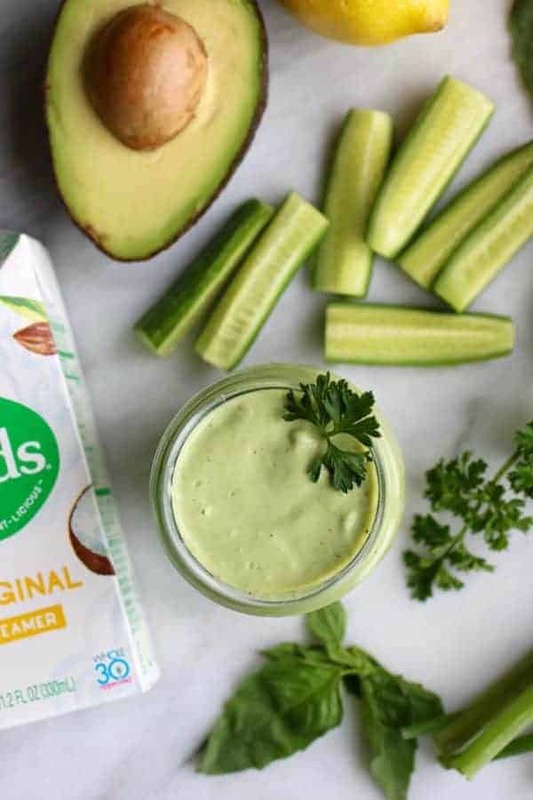 We love that Nutpods is free from carrageenan, dairy, soy, gluten, high-fructose corn syrup, refined sugars, sugar alcohols and is Non-GMO. It’s made from heart-healthy almonds and coconut and has the perfect creamer consistency. Nutpods comes in original (used in this recipe), french vanilla and hazelnut. All delicious but my personal favorite of all the three flavors is hazelnut which I add to my coffee. One tablespoon adds just 10 calories and zero grams of sugar. While it won’t add any sweetness to your cup of joe, it does add a nice flare of flavor…..for us non-black coffee drinkers! We recommend Nutpods! Purchase Nutpods on Amazon. 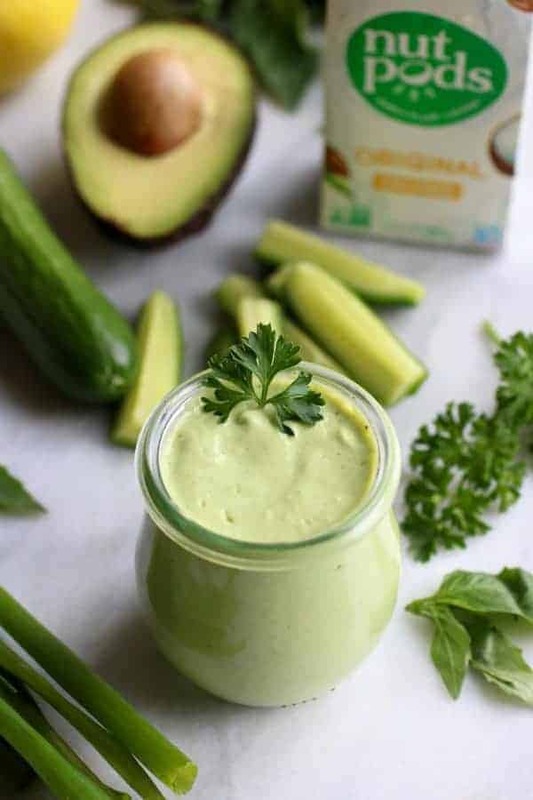 Not only is Nutpods a delicious dairy-free, paleo, vegan, and Whole30 friendly creamer option, it also makes the perfect base in this Green Goddess Dressing recipe. When making this dressing for the first time, I was pleasantly surprised with how creamy it turned out. Yay for creaminess! Typically I add mayo to make dressings creamy, like in our popular paleo ranch, but I was on a mission to make this not only dairy-free but egg-free too (also vegan-friendly). Now, I think I’ll set out on a mission to create another version of our paleo ranch dressing and use Nutpods (recipe to come!) in place of mayo so that it too is egg-free and vegan-friendly. The options are endless! It’s time to build yourself a big beautiful salad and drizzle it with this Green Goddess Dressing! Combine all of the ingredients in a food processor or blender. Process on high until smooth and creamy. Scrape sides as needed. For a thinner consistency, add an additional 1-3 tbsp. of dairy-free creamer. Have you tried Nutpods? We’d love to hear! Pin now to make later. This post was made possible by our friends at Nutpods. Through we received compensation for this post, the opinions expressed here are 100% our own. Thank you for supporting the great companies we works with thereby allowing us to continue creating great recipes and content for you. 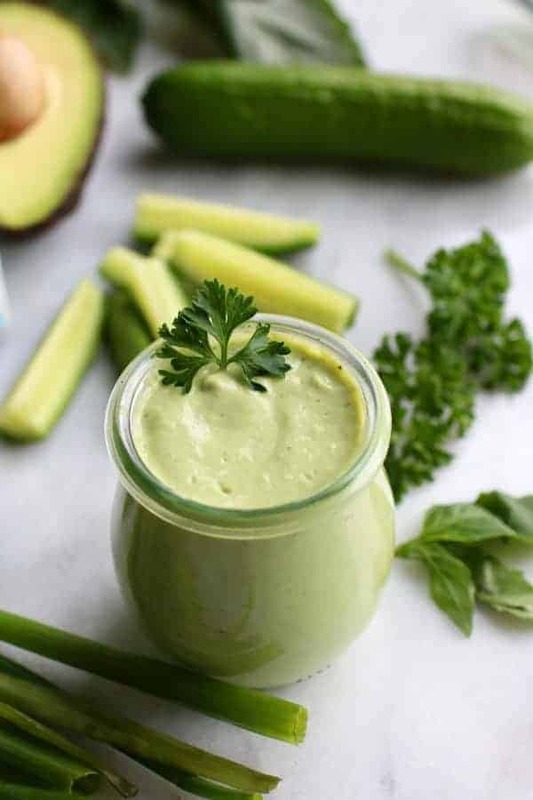 Traditionally Green Goddess Dressing is made with mayonnaise and sour cream (or yogurt, more recently), anchovy paste, garlic and fresh herbs. In this version we replaced the sour cream with avocado to keep the creamy texture but make it dairy-free (and left out the anchovies to make it vegan and more accessible to our readers who aren’t keen on anchovies). If you’re looking to keep the recipe dairy-free/paleo I’d suggest adding tahini (sesame seed paste) to give it some richness or simply use mayonnaise in place of the avocado if you don’t need it to be egg-free or vegan. You can substitute any non-dairy or dairy milk/cream for the NutPods without changing the flavor. Hope that helps! How long have you kept this in the fridge for? Wondering if I can make a week’s worth at a time and if it will keep that long. It should keep fine in the fridge for up to a week though it may darken a bit due to the avocado and basil. I love Nutpods!! I just got my shipment in yesterday, but I switched from original to French Vanilla this time. I didn’t think of using this in other things besides coffee! I’ll order more original to try this dressing recipe and now I want to try the Hazelnut too. Where do you find those cute small jars for the dressing? Nutpods is very versatile and can even be used to thicken soups like our Whole30 Slow Cooker White Chicken Chili. The jars are made by Weck and can be ordered online at Amazon. Can I use coconut cream instead of nutpods? Yes, you can. You may need to add a little water to thin it out but it will work just fine. Hello this looks wonderful. You may have already answers but wokndering how long it will keep? Thank you. Thank you – this should last 3-4 days in the fridge in a tightly covered container. Don’t care for Nutpods in my coffee. Just don’t care for the taste. Going to try Unsweetened Almond milk instead. Okay, now that sounds ahhhhmazing!!!! Looking to get away from all the gums and other garbage in store bought, I bought some bottles and am looking for new recipes. Found this one…. with a suggested ingredient. “nut pods Dairy-Free Creamer” so I looked it up, found the ingredients and THIS….. is EXACTLY WHAT I AM TRYING TO GET AWAY FROM!!!!!!! Acacia GUM Dipotassium Phosphate, GELLAN GUM. Now WHY does this garbage need to be in here? Guess I’ll keep on looking for something else. Feel free to sub any dairy-free creamer of choice. Hi! Do you have a “more traditional” version of the recipe? I’d love to see one that uses avocado but still includes the anchovies! We do not have a recipes as such but I bet there is a good chance one is waiting for you on pinterest 🙂 Pinterest has EVERYTHING! Otherwise I’d suggest adding a little anchovy to this recipe and reducing the avocado a bit. Sounds good!